Although peridot is not a rare gemstone, it is the August birthstone and the gemstone of the month and one of the oldest known gemstones, with ancient written records documenting the mining of this stone as early as 1500 B.C. This is a gem that is especially connected with ancient Egypt, and some historians believe that the famous emeralds of Cleopatra were actually peridots. In natural terms, peridot’s history is different from that of almost all other gems because most gems are formed in the earth’s crust, but peridot forms in magma in the upper mantle, about 20 to 55 miles deep. It is brought to the surface by tectonic or volcanic activity. The main source of peridot in the ancient world was Topazos Island, now known as Zabargad or St. John’s Island, in the Egyptian Red Sea, but today the most commercially important producer in the world is the San Carlos Indian Reservation in Arizona. Peridot was first used a talisman in the ancient world and it has a long-standing mystical reputation. It has been thought to have the power of warding off anxiety, making men more articulate and promoting success in relationships and marriage. This stone has always been associated with light and the Egyptians called it the gem of the sun. 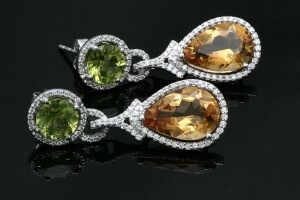 Peridot is similar in color to the emerald but softer in intensity, although the stone can run from yellow to light green and even to an olivine type color. Although this gem is relatively inexpensive and plentiful, peridots of two or three carats are expensive, and a fine eight-carat stone is considered extremely rare. Any stones beyond eight carats are collectors or museum pieces. Tumbled and faced peridot is generally used for bead necklaces and bracelets and is often combined with other gems in contrasting colors. On the Mohs Scale, it is fairly hard and has a toughness that is fair to good. It is stable in light, but heat can cause fracturing if it is uneven or rapid.